Interesting news item posted by First Devon yesterday. Due to circumstances beyond our control the planned 'summer' timetable uplift on service 81, which was due to be implemented from 6 April, will not take place. Therefore the current 'winter' timetables will remain in operation from 6 April, until further notice. 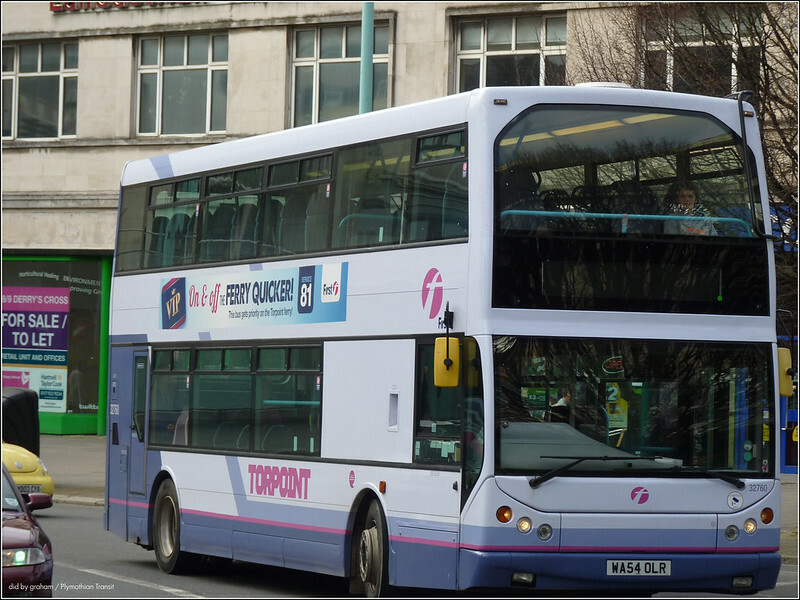 To view the service 81 timetable please click on 'timetables' in the 'journey planning' header above. I wonder what "circumstances beyond our control" means? There have not been any notifications on VOSA for this service so I wasn't aware any changes were being planned. . Seated at Brislington As ever, a major star of any event here in the west has to be the BVBG's superb 1945 Bristol K6A, Western National 353 (FTT 704), which was fitted with this ECW body ten years later. Saturday Night and Sunday Morning Lancaster is unusual for a city of its size (pop. 46,000) in having a Night Bus Service. It's hardly comprehensive - in fact just one route numbered, unsurprisingly, N1, linking the University with the city centre between 0130 and 0300 at weekends during Unviversity Terms only. Super Silent Seven to Shenley  The Super Silent Seven is anything but! The electrical whine is at least as noticeable inside the vehicle as a modern well-managed diesel and thus disappointing. Have the tenders been awarded yet by Cornwall County Council for the next financial year? The other suggestion I have received is just this - the delay is that the council have decided to hold back and start the summer service at the end of May and have a shorter summer season, to save money. I would have thought that First would have just said this at the start. Similarly anyone taking the train down from Plymouth to Penzance & hoping to join the 300 open topper from Easter is going to be disappointed as First have de-registered all 3 sections ( per Vosa ) from PZ ,Lands End & St Ives from 18th April ( Good Friday) when it would normally commence.Off peak parts of the service were supported by the council - will it be back for the main summer months as it is a great scenic route ? Have heard the tenders are yet to be awarded in Cornwall, so it may well be that! My first thought when seeing something like this would be that there was a delay submitting the registration change to the TC & they requested it under a short-notice request at less than 56-days which the TC had refused (they are tightening up much more on this recently and some TCs are stricter than others). That said if that was the case you would have expected them to be able to provide the alternate date already as the TCs cannot refuse to register a service with 56 days notice, possibly they wanted it in for the Easter Holidays and not having been able to achieve that they have cancelled the change and will bring it in much later in May to coincide with better weather & half-term having missed the Easter Holidays, if that is the case you would not have seen a registration change appear as no change would have been registered in the end. If it was a TC refusal First are clearly being politic so as not to cause further issues with the TC, other operators having been refused short-notice for less than clear reasons sometimes have explicitly stated it on their updates so customers know the reason and so won't blame the operator - I guess it depends on who caused the delay in submitting, if it was just First not getting the paperwork sorted on time then they have no one else to really blame.